After visiting Vogue Australia and Vogue Living magazine offices each day last week as I dropped my daughter Rebecca off for her wonderful week of work experience, I couldn't help but notice that there was something missing. I was told a couple of months ago that the end had come for this lovely magazine and I just couldn't believe it then. 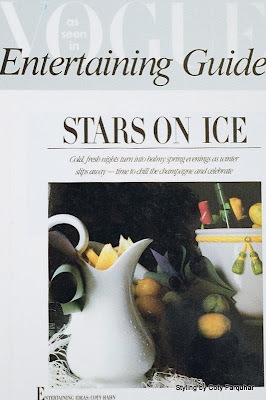 I was with Vogue Entertaining Guide when I was 25 years old (23 years ago) on the very small editorial team as Editorial Associate, creating & art directing stories and styling food and table settings in many private homes and wonderful restaurants with amazing chefs. 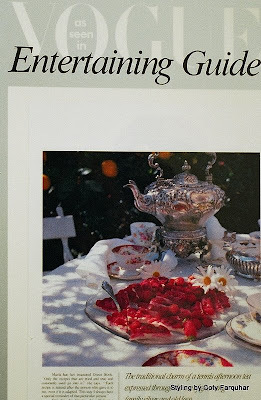 I was also the one to create the pages "Entertaining Ideas" which I just loved to bits ...and I also loved, loved, loved helping with the table settings pages. This is a small selection of some of my work from the 80's when I worked there, I'm sorry these images are a bit scratched & dusty as they are from my old portfolio book. 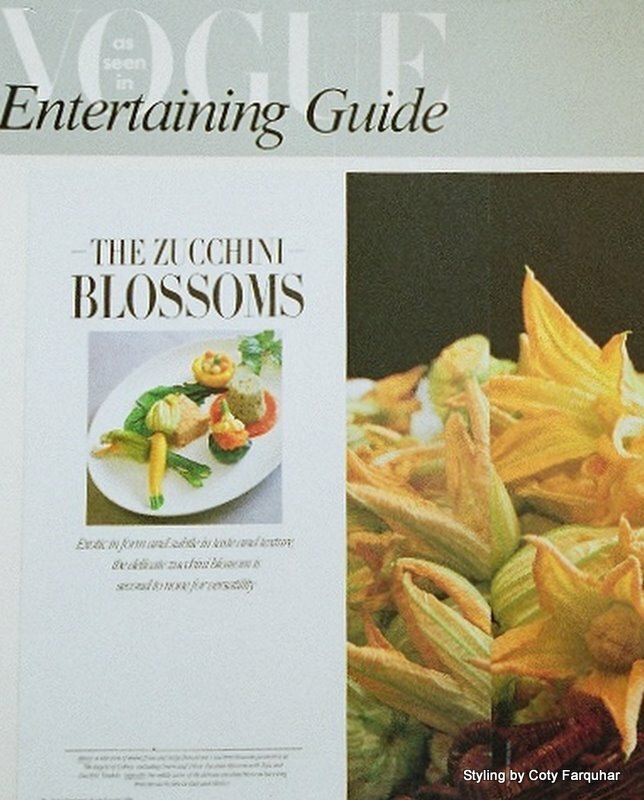 I worked with Executive Chef, Serge Dansereau (from the restaurant & book Bather's Pavilion at Balmoral) on this fantastic story on Zucchini blossoms and I spent many of my days in the kitchen at the Regent Hotel. I must find the chocolate stories that we did together, it was an amazing story!! 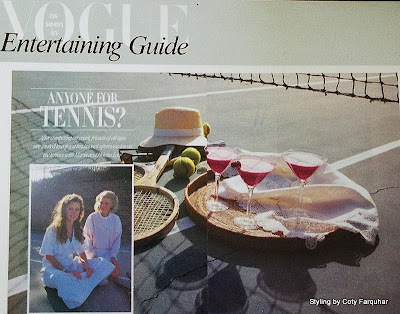 Aren't all tennis parties like this? This was story I did in Canberra and an unexpected delight as I had planned to do a story on a wonderful new food shop and as the day unfolded we ended up photographing all this amazing food in the homes of the owners. My story ended up getting eight pages. 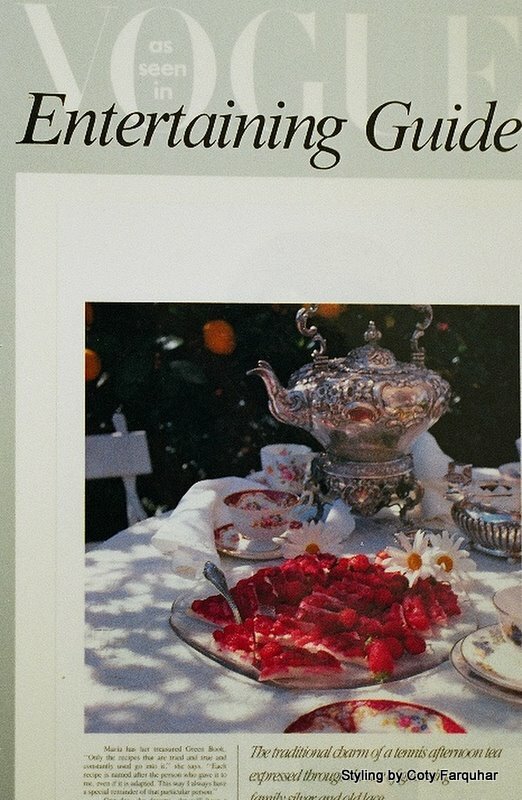 My Entertaining Idea pages, this one was about all the wonderful items available for a cocktail party. I gathered items for everywhere and photographed this in a studio. 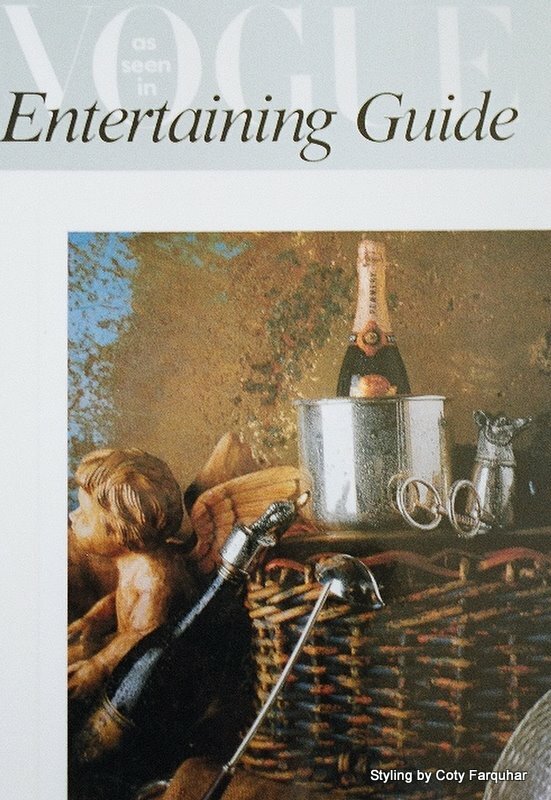 Ice buckets, champagne buckets, beautiful bottle openers, bottle stoppers, accoutrement's and more. I also collected some wonderful antique baskets which were perfect for storing wine. 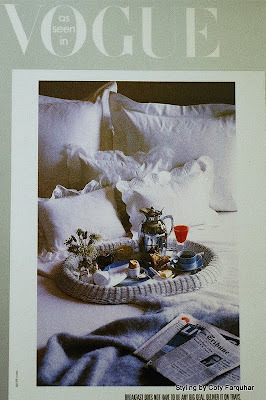 The tray that I used below for this breakfast in bed was actually a mirror. I certainly learnt many, many things while I was there and my life was so enriched. Susan at Between Naps on the Porch in the USA is celebrating her 97th Tablescape Thursday party today and I just love being a part of it and visiting everyone. Always so breathtaking, Coty...and always so very professional. I garner so many wonderful ideas from your postings. Thank you for sharing your exceptional ideas & photos. 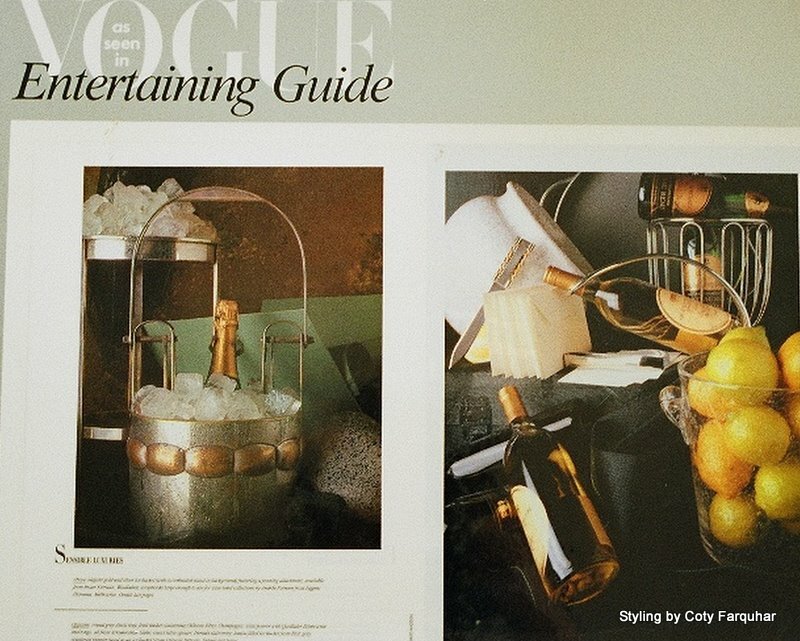 The ice bucket one is my most favorite! Coty, I can imagine how sad this is for you.I didn't know this magazine before, but all the pictures look so lovely. And you can be very proud, you did a phantastic job. 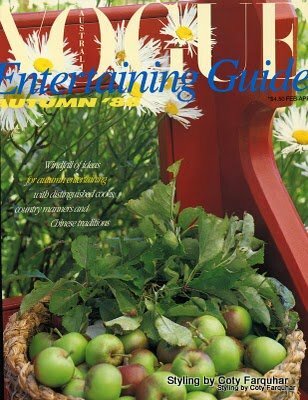 So nice, that you post your pretty photos now on the blog - so I can see them without the need to get this magazine here. 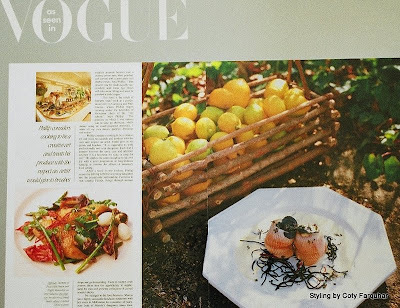 It's sad to hear the end of an era with Vogue Entertaining but your images from your own work there are just beautiful. I'm also pretty certain your daughter is going to adore her work experience week with Vogue. I don't think there would be too many who wouldn't. It is sad to lose a good publication, that one looked like it was chocked full of ideas and inspiration, due to your fantastic styling! Hi friend. Oh my, I can certainly understand how difficult it is to see such a fine publication leave the coffee tables of so many devout readers. You certainly had quite the following. Listen to me...you still have a following! My goodness it's dizzying for many just to keep up with you and your whereabouts, as you are a busy wife, mother, stylist, photographer, blogger, gardener & friend. After you unpack ALL your bags, please do tell us more. Good to have you girls home safe & sound. oops! one more thing....I would love to grab a Styling Gardens button for TLPC. I have my eye on something here. What a wonderful story to tell. Your photos were beautiful. 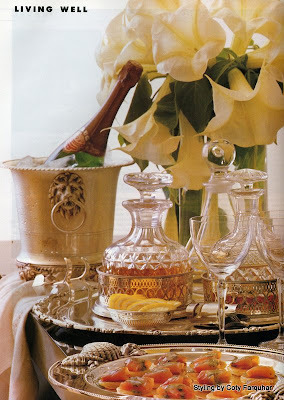 I am, as always, drawn to the gorgeous photos of silverware and glassware. Thanks so much for sharing these exciting times with all of us. I look forward to seeing the rest of your blog. A sad day indeed dear Coty. 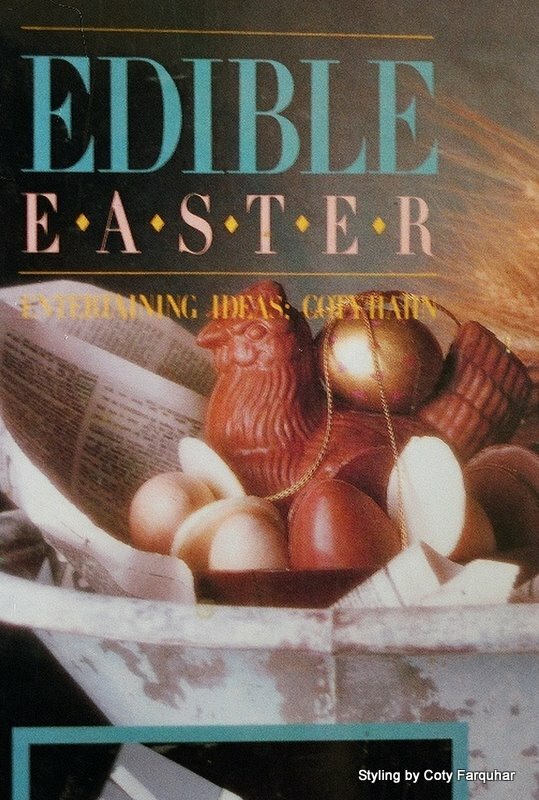 I've got all my copies from the 80's & 90's stashed away in boxes & can't bear to part with them. What beautiful compositions and photos. You truly have wonderful style and are so inspiring. I too am sorry to hear of the end of an era. Beauty in all of these forms is so wonderful to behold. Thanks for sharing with us on Tablescape Thursdays. I love perusing all of the posts. I loved Vogue Entertaining even though by the time it hit newstands here it was 8 weeks old. I still have many many tear sheets. Sad to see such a inspirational periodical fold. Hi Coty Visiting from BNOTP and I'm so glad I am. Your photos are amazing. I am going to look at your older posts too. Isn't it wonderful that you can still share all your creative tablescapes through blogging? And we get to have the pleasure of seeing them. Thanks for sharing your beautiful ideas. This must be heartbreaking news for you (and I'm thrilled for your daughter to have her internship time there, though, as internships like that really jump started me!) 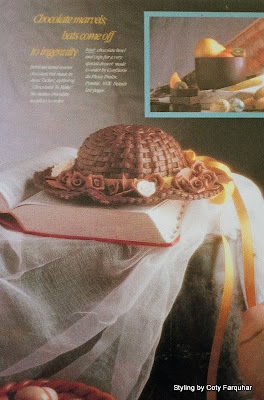 but at least you have these wonderful images from your time there. What's amazing about all of these vignettes that you styled is that THEY ARE STILL COMPLETELY RELEVANT TODAY!!! That means they are classically beautiful and truly timeless. Your life was so enriched by what you did and I know that those lives you touched were enriched as well. Your talent is a gift that comes from within, something that is not taught. I love seeing what you do and look forward to what you share with us next. It sounds and looks like you have many treasured memories from Vogue Entertaining Guide. Thanks for sharing your exquisite works of art from the magazine. I'm so pleased that you're back and very glad to hear that you enjoyed your time with old friends in Sydney. 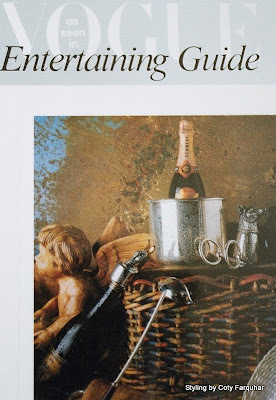 Sorry Vogue Entertaining Guide is no more. I know the magazine meant a great deal to you. How fortunate they were to have had someone with your unique gifts during your time there! Thank you for sharing examples of the styling and stories you did for the publication. They're all absolutely stunning! I would have expected no less of course. I remain in awe as I have from the first day I visited Styling by Coty Farquhar.